Patricia Crisafulli is a creative writer and best-selling author. She is also the founder ofwww.FaithHopeandFiction.com, a free bi-monthly e-literary magazine. A collection of her essays and short stories, Inspired Every Day, will be published by Hallmark in March 2014. Eighteen years after the genocide that made Rwanda international news, but left it all but abandoned by the West, the country has achieved a miraculous turnaround. Rising out of the complete devastation of a failed state, Rwanda has emerged on the world stage yet again—this time with a unique model for governance and economic development under the leadership of its strong and decisive president, Paul Kagame. Here, Patricia Crisafulli & Andrea Redmond look at Kagame’s leadership, his drive for excellence and execution that draws comparisons to an American CEO and emphasizes the development of a sophisticated and competitive workforce that leverages human capital. In Rwanda, the ultimate turnaround, strong and effective leadership has made a measurable and meaningful difference. Rwanda’s progress offers an example for other developing nations to lift themselves out of poverty without heavy reliance on foreign aid through decentralization, accountability, self-determination, and self-sufficiency. 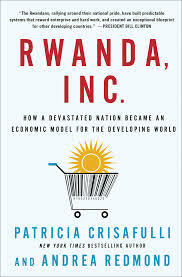 The authors also explore Rwanda’s journey toward its goal of becoming a middle-income nation with a technology-based economy, and its progress to encourage private sector development and foster entrepreneurship, while also making gains in education, healthcare, and food security—and all with a strong underpinning of reconciliation and unification. As so many nations stand on the brink of political and economic revolution, this is a timely and fascinating look at the implications of Rwanda’s success for the rest of the continent—and the world. I found the first part of the title was very strange. It suggests Rwanda is a corporation or is run like one. And we all know, it shouldn’t be. Pure capitalism is a predatory system. The book transcends a lot of subjects and, that I appreciated a lot. From Rwanda’s history, the authors describe the situation before the genocide, then they went to life after genocide, to finally finish with Kagame’s leadership. I was a little disappointed by the depth of the analysis in this book. I was expecting more insights into why Kagame is being vilified in the media for example. Instead, this book reads as the rehabilitation of Kagame. To quote a review I saw recently, this book reads as an investment prospectus for Rwanda. That exactly how I felt! If you had no prior knowledge of Rwanda’s history and politics, this book will shed some lights into why the genocide happened, who masterminded it…. However, that information is readily available. The added-value should have come from the business/development side , but it was just not enough. The authors only quoted government officials , most of the deal seems to have been copied from the news, at least from my perspective. All said and done, if you know much about Rwanda, you can pass this book. Otherwise, well, you can learn a thing or two about the wonders Kagame is doing in Rwanda. There are a lot of controversies attached to Kagame these days, I have no idea whatsoever of what is right or wrong. But I would said they is no fire without smoke. Kagame is certainly attracting a lot of foreign investment to develop Rwanda. The question we need to ask now, I believe, is at what cost? Sub-Saharan Africa have become a master at the game of chasing GDP. But really, what is GDP? Just a number! no matter what you achieve, it should reflect and impact positively on the population. Otherwise, nothing was achieved. The other reflection, one can make about this book, is the fact that the strong and decisive leadership of Kagame is heavily discussed throughout the book. Meanwhile, Africa is still suffering from the leadership of very strong characters. i will let summon examples of strong leader we have had in the past.